On the morning of Memorial Day, I was awake before everyone else. I began tip-toeing around the kitchen, scoping out breakfast options, hoping I’d see something that would catch my eye. When I saw a fresh loaf of whole wheat bread, I thought about making French toast but I wanted something more savory. I grabbed a carton of eggs, almond milk, spinach, Canadian bacon, cheese and Greek yogurt and got to work. 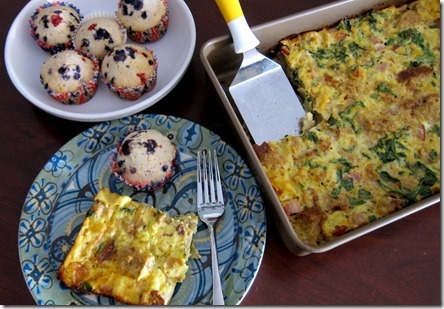 The end result was a fluffy and filling breakfast casserole that everyone seemed to enjoy! Easy Breakfast Casserole is simply a fluffy and filling breakfast casserole that everyone seemed to enjoy! For those of you looking for grab ‘n’ go weekday breakfast options, you could easily prep this the night before and bake it in the morning, or bake it at night and simply reheat it in the morning. Please email me at pbfingers@gmail.com with your mailing address and a direct link to the pendant you would like and we’ll be sure to get it to you right away. To those of you who are interested in bama + ry jewelry, you can use the promo code JULIE20 through June 15 for 20 percent off anything in the bama + ry Etsy store. Every year my mom makes a breakfast casserole called cheese puff casserole on Christmas morning and it is the best. I still need to share that one with you guys! Okay that casserole looks absolutely delicious. We always make a breakfast casserole Christmas morning but I might have to suggest this one for this year! This looks great (and easy)! 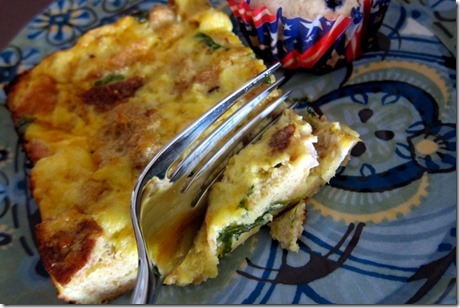 Woul be perfect for a brunch potluck too since it seems like it can feed a crowd! My mom makes a casserole using via quick, eggs, ham, onion, cheese and bacon.. It is one of my favorite special occasion breakfasts! Hi Julie! As always, I love checking out your posts where you include good meal ideas! Now that the summer months are approaching, I’m always looking for more group-sized meals since summer means more family and friends time, and more people to cook for! That being said, I was wondering if you have tried any new dinner recipes? My recipes have been getting a bit boring lately at dinner time, and I’m looking to spice things up, even with the warmer weather. Thanks! I love anything with potatoes + cheese + bacon. Realllll healthy over here ;). Can you honestly say your giveaway winners are chosen randomly? The last couple winners have seemed to be hand-picked, based on their comment/reason for wanting to win. Not that I have a problem with the winners (I didn’t even enter the contests), just wondering if you’re providing complete transparency regarding how the winners are chosen. Hi Erin! I use random.org. My comments aren’t numbered like they used to be (they now nest within in a post so the pages load faster), so I look to see how many pages of comments I have for the giveaway. I then do the random number generator on random.org for the number of pages, then go to the page that “won” and run it again (1-50) for the winner since there are 50 comments on each page & just count down from there. I hope this makes sense! 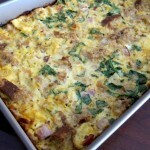 My favorite b-fast casserole involves spinach, tomatoes, onions, mushrooms and bacon! Yumm! My mom makes an awesome egg bake breakfast casserole that has hardly any cheese but a lot of fresh veggies (bell peppers, tomatoes, mushrooms, spinach) and I love it! This looks fantastic! I’ve actually never had a breakfast casserole. My dad tends to make more flour-based breakfasts than egg/casserole-based, which I’m perfectly fine with. 🙂 Casseroles look so easy to make, though. I might have to give it a shot one of these days! This is probably crazy but I’ve never had breakfast casserole! Ever. So sad right? I don’t really eat casseroles because I don’t eat eggs, but I love anything that has has browns, cheese, and veggies baked together!! 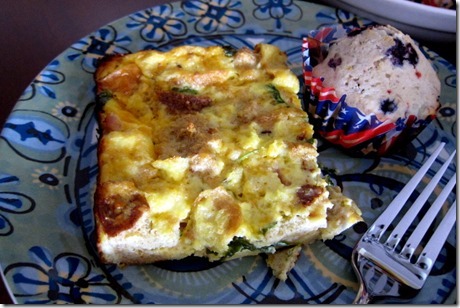 i never make breakfast casseroles – not sure why…. i may try this one! That casserole looks amazing! I would definitely make this and just leave out the meat! I’m looking to host people at my new house soon and this seems like the perfect morning breakfast dish! To be honest, I don’t know if I’ve EVER had a breakfast casserole. Maybe at dinner? I’m not sure. I’m more of a dippy egg fan with jelly on toast. Mmm! This would make a great dish if you’re having guests stay overnight, though! So quick and easy! 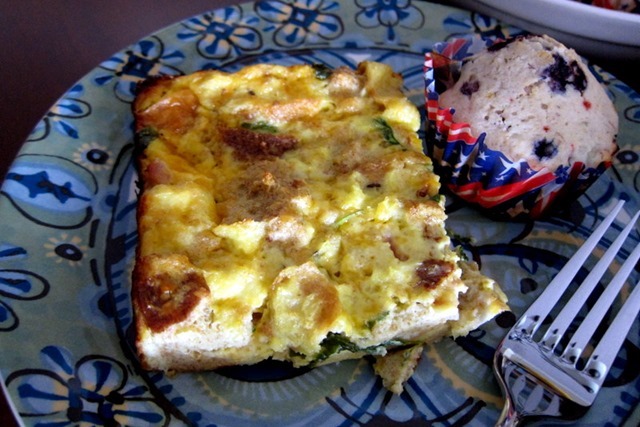 I love any egg casserole, but especially ones with spinach and feta cheese, delish! I haven’t made this type of casserole in forevs–looks delicious! I’ve never had a breakfast casserole that I didn’t like…Two of my favorites that my mom makes are a sausage cheesy one that looks a lot like the one you have pictured above and then a french toast one that is killer sweet and AMAZing!!! I make something similar to this but never thought to put bread in. I LOVE bread. I will have to try that out. It isn’t exactly a casserole but I have made this baked french bread thing for brunch before. It was the best thing ever! Have you ever had Paula Deans French Toasts casserole. OMG it’s like a once a year thing but AMAZING!!! This sounds YUMMY! 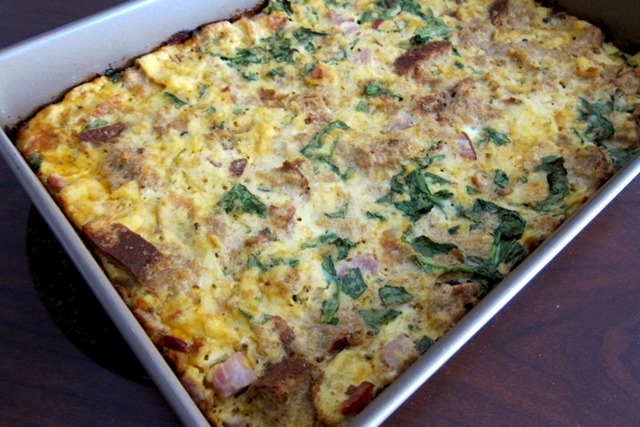 Breakfast casseroles are one thing that my whole family will eat…including the kids…so I’ll definitely be trying this one out. Thanks! Thanks for the discount at the etsy shop – I purchased the anchor earrings you had in your giveaway post! Looks super delicious and easy! Did you use frozen shreded spinach or fresh spinach? I’ve never seen fresh shredded spinach. Breakfast casseroles are the best! This one looks delicious! 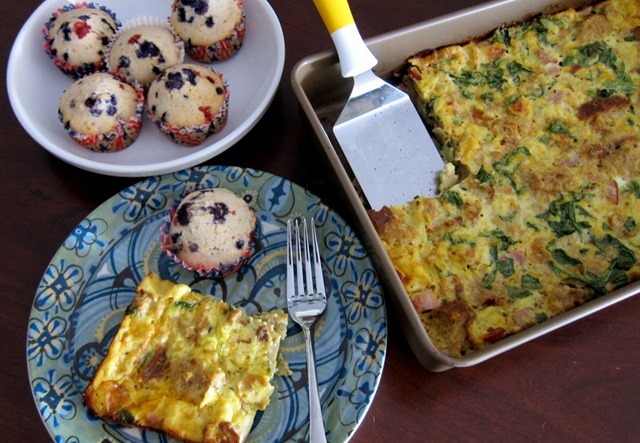 A breakfast casserole is such a great idea to mix things up! I’ve been in a bit of a breakfast rut, either an egg sandwich, oats, or pancakes. A recipe like this should definitely help snap me out of it! Made this tonight for a potluck meeting at work and added basil and red peppers along side some whole wheat crepes and my co-workers loved it! Thanks so much for the recipe!